This one was opened up at home, poured into a pint glass, and enjoyed on the couch in front of the TV. The first sip got me hooked. Unique, interesting, smooth, and very drinkable. In fact, it was so incredibly smooth that I decided to let it warm up in case I was missing out on something. The chocolate was stronger than the cherry which was stronger than the vanilla. But all three were very well balanced and didn’t overpower the stout. I kept wondering where the bitterness was, it seemed almost non-existent. This was a really fun tasting for me because I got to the bottom of the glass and still found myself searching for more. This is a bottle-conditioned ale and I’d love to see what it’s like after aging it a bit. This is a 5 cap beer in my opinion. One of those rarities that I’m glad I had a chance to enjoy. I find on another one I’ll grab it straight it away. So if you see one before I do then you’d better buy it. I’m really starting to re-think sharing my secret spots with you all right about now. 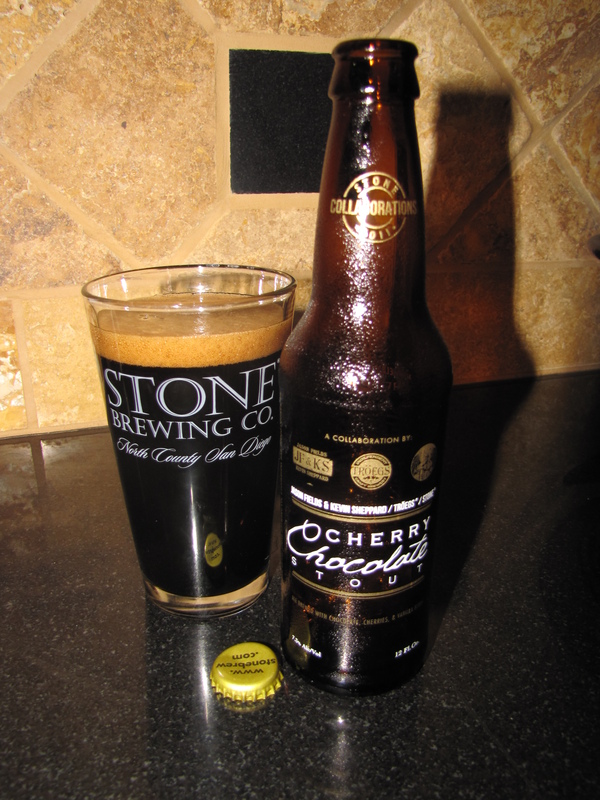 This entry was posted in Cherry, Chocolate, Home Brew, Review, Stout and tagged 7.3%, Cherry, Chocolate, Collaboration, Jason Fields, Kevin Sheppard, Stone, Stout, Troegs by Erik. Bookmark the permalink.